President Maduro is the successor to Hugo Chavez, a man loved by the socialist Left in Hollywood and the fringes of the Democratic Party. Most observers place the blame for the situation in Venezuela at Chavez's feet. While Chavez and Maduro have the same base of support and the same policies, Chavez possessed a political ability to keep tensions at a simmer, unlike Maduro, who has seen them boil over. 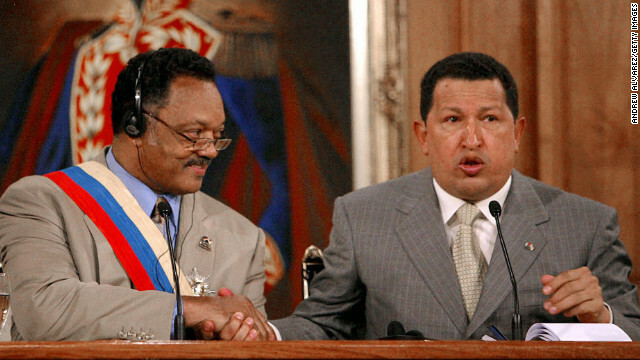 As we watch dozens of Venezuelans die in the streets, struggling to save their country from the brink of disaster, this is a good opportunity to point out who on the Left in the United States helped legitimize Chavez during his time in power. During the Clinton administration, amid negotiations with Yasser Arafat, the White House became consumed with hugs; specifically, how President Clinton could avoid Arafat's famous bear grip handshake that would become a full-on embrace. There's an amusing anecdote about how the White House practiced and choreographed how Clinton could avoid appearing too chummy with Arafat in front of the cameras ("Clinton would squeeze in underneath the biceps and block him."). Why did Clinton's staffers spend hours practicing how to avoid an Arafat hug? Because they knew that optics matter. This is a lesson that President Obama has yet to understand, and this photo, widely circulated around the globe, including inside Venezuela, lent Chavez enormous clout. He’s one of the most important forces we’ve had on this planet, and I’ll wish him nothing but that great strength he has shown over and over again. I do it in love, and I do it in gratitude. “I just want to say, from my very American point of view, of my friend President Chavez: It is only possible to be so inspiring as he is, as a two-way street. And he would say that his inspiration is the people. Chavez praised Stone's work for depicting what he said were improvements made across Latin America. 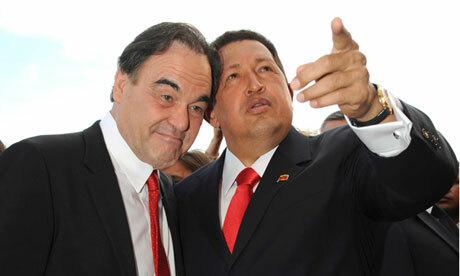 "Rebirth is happening in Latin America, and Stone went to look for it and he found it," Chavez told reporters. "With his cameras and his genius, he's captured a good part of that rebirth." In the interview with La Nación, the veteran actor said the strong criticisms against Chávez’s successor Nicolás Maduro are normal as it is a democracy and there will always be detractors. Other dishonorable mentions present at the screening: Susan Sarandon,Danny Glover, Shia LaBeouf and Carey Mulligan. The relationship between Mr. Meeks and Mr. Chávez has been the subject of some scrutiny. In 2006, one of the representative’s donors, R. Allen Stanford, asked Mr. Meeks to make Mr. Chávez aware of a legal dispute he was having with a top banking official in Venezuela. 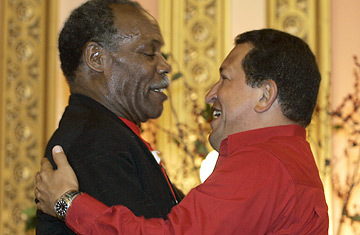 Mr. Meeks reportedly agreed and traveled to Venezuela to meet with Mr. Chávez, according to published reports. The banking official was eventually indicted in Venezuela. Jackson, who leads a Chicago-based social justice organization and is the father of former Rep. Jesse Jackson Jr. (D-Ill.), didn’t walk back the comment. He called for engagement with the new Venezuelan government, adding that there are trade opportunities with the oil-rich country and that Venezuela could serve as an ally in fighting the drug-trafficking war. “So democracies evolve and if we’re engaged, we can help it evolve in the right direction,” Jackson said. We've seen where the Venezuelan "democracy" has evolved. We can thank the American lovers of Chavez mentioned above, and many more, for the bloodshed we're seeing in Venezuela today.